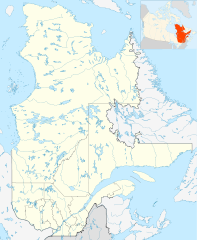 Matagami (/mətɑːɡəmi/, French pronunciation: ​[mataɡami]) is a small town in Quebec, Canada. It is located north of Amos, on Matagami Lake, at the northern terminus of Route 109 and the start of the James Bay Road (French: Route de la Baie James). The town had a population of 1,526 as of the Canada 2011 Census. Matagami was founded in 1963 with the development of mining in the area. Previously, it existed only as a very small prospecting camp accessible only by float plane, but after a viable mineral deposit was found in the late 1950s a permanent settlement began to be established. In 1962, the Quebec Toponomy Commission attempted to name the new community Mazenod after Charles-Joseph-Eugène de Mazenod, the founder of the Missionary Oblates of Mary Immaculate, but after a public outcry by local residents the community was named after Matagami Lake. The name Matagami means "the confluence of waters" in the Cree language. The first church service in Matagami was held on 17 April 1962. The two primary employers in the city are Xstrata and Domtar. Domtar has been in Matagami since 1988 when the company bought out Bisson & Bisson. Xstrata entered Matagami in 2006 when it acquired Falconbridge Ltd. In 2008, Xstrata put Perseverance, a zinc-copper volcanogenic massive sulfide ore deposit, into production. Perseverance has a mine life of 5.5 years. Since 1957 ten deposits, including the world class Matagami Lake deposit (25.6 million tonnes grading 8.2% Zn, 0.56% Cu, 20.91 g/t Ag, 0.41 g/t Au), have been discovered and mined out for a total of "44.4 million tonnes with a similar average grade." Further exploration is continuing in the camp through a 50–50 joint venture agreement between Xstrata and Donner Metals. In late 2008, Donner Metals Ltd. announced that Xstrata Zinc Canada was in the process of completing a scoping study at their jointly owned Bracemac-McLeod property. It is the nearest city to the Lac Doré Vanadium Deposit. The community is also one of the distribution points for goods and services to the James Bay Hydroelectric Project. As well, Matagami has a small tourism industry due to the popularity of fishing and hunting in northern Quebec. Hotel Matagami and motel caribou include full service bars. Matagami is located in the geographic centre of Quebec quite far to the west and on similar parallels to Winnipeg and Vancouver further west in Canada – all of which have milder climates to a various degree. It is several parallels north of Montreal and Quebec City and in a sparsely populated area. In terms of other parts of the world, Matagami is on the same parallel as the hot Rhine shift around Mannheim in Germany, which is more than 10° C warmer in terms of yearly mean temperature. In spite of being located below the 50th parallel Matagami has a subarctic climate. The winter season is long and cold with a January daily mean of −20 °C (−4 °F), but summer temperatures during the short season are quite warm for subarctic climates. On average around 133 days of the year do not have temperatures above freezing. The cold air is dominant with 224.4 days of the year averaging air frost. Also a full 30.5 days of the year should fall to below −30 °C (−22 °F). Around three days in summer are warm enough to reach 30 °C (86 °F), indicating a very continental climate. Nearby lakes include Lake Olga. Matagami is served by a community radio station, CHEF-FM, as well as by a rebroadcaster of Première Chaîne's CHLM-FM. ^ a b "(Code 2499015) Census Profile". 2011 census. Statistics Canada. 2012. ^ "Apella Resources reports on exploration effors at Lac Dore North Vanadium Project". Proactive Investors UK. 2 December 2009. Retrieved 1 January 2010. ^ "Matagami, Québec Climate Summary". Weatherbase. Retrieved 31 January 2015. ^ "Matagami, Québec Temperature Averages". Weatherbase. Retrieved 31 January 2015. ^ a b c "Canadian Climate Normals 1971–2000". Environment Canada. Retrieved 27 April 2016. ^ "Canadian Climate Normals 1971–2000". Environment Canada. Retrieved 10 November 2012. This page was last edited on 1 March 2019, at 16:45 (UTC).